Every genealogist and family historian faces the task of identifying people in records. Identifying the people on Holme’s map is no different. In the end, each person in the past is no more than a collection of records. All that is left of Walter Bridgman’s life in Pennsylvania is 21 records: he immigrated from Cornwall, married Blanche Constable by approval of Middletown Monthly Meeting, owned land, signed a paper against selling rum to the Indians, died, left a daughter. Unless a descendant somewhere has an heirloom, that is the sum total of the material we have for Walter. He is typical of many of the people on Holme’s map—the records form a straightforward pattern that fits one and only one person. Some of the people on the map were prominent—they served in the government or were personal friends of Penn or otherwise left substantial evidence of their lives. Men like John Bevan, Thomas Lloyd, John Simcock, Christopher Taylor and James Harrison do not need to be identified; they are historical figures who in a sense have already been identified. About a hundred of the names on the map fall into this category and required little research. Another group of people were not prominent, yet left records that formed a pattern, people like Walter Bridgman. Given the population involved here, we would expect to find an emigration record, land purchase, membership in a Quaker meeting, marriage and death. When we find these records for someone, with a name that is probably unique, and where the records fit into a location matching the tract on the map, then we can assume we’ve found a person. This is the largest group of people on the map—it required research to find them, digging into the records, yet the records when found formed a recognizable pattern. There are several hundred people like this on the map, famous only to their descendants, people like John Jennet, Mary Bradwell, Luke Hank, Michael Isard and Thomas Groom. Some people on the map posed problems: names radically different from the one on the map, two men with the same name, records that don’t form a neat pattern, people who lived quietly and left few records. These required more research and more evaluation of the evidence. For example, who were the widow Bond, John Bye, Drawell, Daniel Hough, and John Swart? With some research, these were found to be the widow of John Bond, the First Purchaser John Boy, Joseph Drake the 1683 emigrant, John Hough of Darby (not Daniel), and Jan Classen the horse trader who was known by different names. About fifty of the people on the map required this extra level of analysis. That leaves a few genuine puzzles: names that don’t match any known records. We have to assume that these were errors, either by Holme or by the engraver in London who had no personal knowledge of the people. There are five of them: John Denne, John Eluny, Free School, Widdow, and William Jones. John Denne is shown on the map in Whitpain township with John Goodson. There were several men around named John Dennison or Denning or Densey, but none of them can be tied to this land in Whitpain or to the physician John Goodson. John Eluny is shown in Westtown next to Francis Yarnall; there are no records of any Eluny at the time, and no land records that give a clue who this might be. The tract marked Free School is in Chester Township. There are no records of land being set aside for a school at this time. The only owner near there was Richard Few, so perhaps this was an error for his name. Widdow is on the map in Edgmont. When Holme showed the land of a widow he always included her surname, for example the widow Hurst or the widow Shorter. There was a William Findlow who bought land in Edgmont in 1687, but this seems late to make it onto the map, though it was in about the right place. Finally, there is the problem of William Jones. There were men around named William Jones, but none of them can be tied to this land in Newtown. 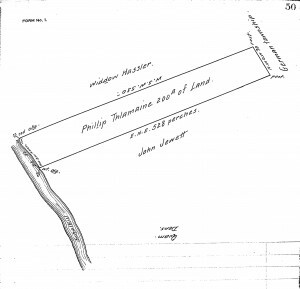 Smith’s Atlas of Delaware County shows this land as belonging to Robert Dunton. Did one of the men named William Jones acquire the land from Dunton? These are puzzles that cannot be answered yet, possibly not at all, given available records. If you have an early Pennsylvania ancestor, he or she might have bought their land from William Penn or from someone else. If they bought from someone else, the record will not be found in the Old Rights Index, as discussed in If your ancestor got land from William Penn. Instead the record might be found in an early deed book. There is no guarantee of this. There was a fee for recording deeds, and some people did not bother. On the other hand, land was vitally important to people, and many deeds were recorded. The earliest deeds for Chester County were recorded in Philadelphia, until 1714, when Chester set up its own recorder. For Bucks County deeds were recorded from the earliest years. Although some people may have chosen to record theirs in Philadelphia, most will be in Bucks county. The early deed books for Philadelphia city and county are available on microfilm, at the Philadelphia City Archive and at the Historical Society of Pennsylvania. To find the deed, you need to know the deed book and page. There is an online index for both grantors and grantees, unwieldy to use. James Duffin has prepared a detailed guide for using it. Once you find the deed book and page number, you can look for the text of the deed itself, either on the microfilm or online, by subscription only, at the Historical Land and Vital Records site of the Philadelphia Department of Records. Duffin’s guide covers how to use this as well. When you find a deed, what will it tell you? Here is an early example. In 1688 John Bowyer (in the deed as Bower) sold a piece of his land to Edward Lane. It was a tract of 50 acres, out of Bowyer’s tract of 200 acres; Lane paid £15 pounds for it; it lay next to Germantown; Bowyer signed it on the 5th day of the 4th month in 1688; it was acknowledged in county court the same day. You can’t tell from a deed whether the grantor or grantee lived on the land, although you can tell whether it had a house or other improvements (this tract did not) since those are described in the deed if they exist. You can often find the occupation of the grantor and grantee, although not in this example. If the land was a gift, sometimes given “for love and affection”, instead for money, it suggests a family relationship. The deed by itself may not be informative, but you can put it together with other pieces to form a picture. 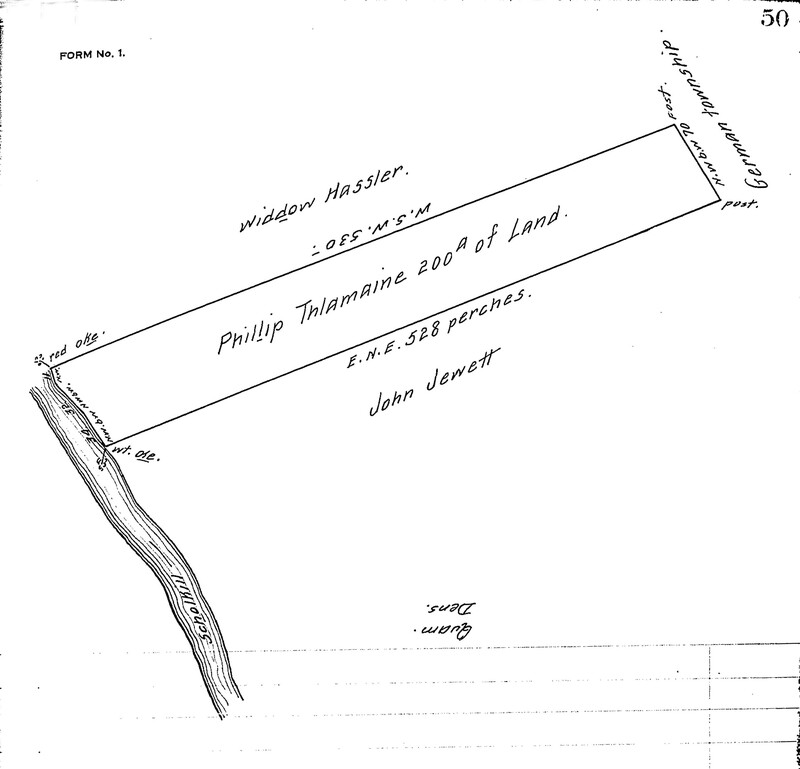 If you look at Thomas Holme’s county map, to the east of Germantown, you will see John Bowyer and William Lane. William was Edward’s father, a grocer of Bristol, England and a First Purchaser in 1681. William did not emigrate, but Edward emigrated and took up the family land. When Edward married Ann Allen in 7th month 1688 he was described as of Philadelphia County, suggesting that he was living on the land (rather than on his city lot). 1 The land lay in Bristol township; often the townships were named for the place in England where people came from. Lane was not the only landholder in Bristol from Bristol, but his tract, along with John Barnes’, was one of the largest in the township, so it may have gotten its name from his home place. For Chester County, most deeds were recorded in Philadelphia until 1714, but there were some in Chester. There is an online index for deeds to 1850 at the Chesco site. The deeds themselves are at the Chester County Archives in West Chester. A published source by Carol Bryant, Abstracts of Chester County Land Records, in two volumes, has good abstracts of deeds, including price paid, size of the tract, and names of adjoining landowners. If your ancestor emigrated to Pennsylvania in the earliest year of the province and owned land there, he or she might have bought the land directly from Penn. To find the records, you need to look for warrants (orders to lay out the land), surveys (a map showing the land) or returns (a verbal description of the land). These were all created at the time, but many papers did not survive. They were kept in various offices around Philadelphia in bins or bundles or bushels by the Surveyor General and the Secretary of the Land Office, who in the earliest years did not keep organized offices. At various times the records were organized and listed, in 1698, 1759 and again in 1833. These lists mostly survive and are most or less accessible, and they don’t completely overlap. The most accessible are the 1833 copies, recopied in 1909 and put online at the website of the PMHC, the Pennsylvania Historical and Museum Commission. This trove of thousands of pages holds many treasures. The primary documents here are the Copied Survey Books. In spite of the name they are a mix of document types: warrants, returns, petitions, caveats, orders. They are not in an organized order (although the older ones mostly cluster around D61 through D89.) Fortunately there is an index for the transactions before 1733, called the Old Rights Index. It is roughly alphabetical, with multiple pages to search for each letter. You need to keep in mind as you use it that the dates are systematically wrong. To find a document in the Copied Survey Books, start with the Old Rights Index. Suppose your ancestor was James Boyden, an early settler in Bucks County. In the Bucks County Old Rights Index, following the link for the B names, you find two entries for Boyden. One is listed as a return (actually a warrant), the other as a survey. The dates on both are wrong, by the usual two months. To see these documents, follow the link on the PMHC overview page for Images of all surveys. Go to book D72, page 101 to see the warrant. Penn ordered Holme to lay out 500 acres for Boyden, also his land in the Liberties, to be settled within one year under the usual conditions. Holme must have been busy in the summer of 1684, since by his note at the bottom he didn’t order Israel Taylor to do the survey until four months later. Oddly enough Boyden already had his land, had probably been settled on it for two years when this warrant was issued. If you look at book B22, page 4, you see the 1682 survey, made by Richard Noble, a beautiful map with accompanying description. Boyden’s land lay on Neshaminy Creek, with marshland on two sides, the King’s Road running through it, an Indian path touching at one corner, and a horse-trading Dutchman as one of his neighbors. To find the order for this survey, you have to page through the B section of the Old Rights Index to the end, to find an unnumbered listing for James “Boyd”, 900 acres, D82, 106. This leads to an order from Thomas Holme to Richard Noble in 7th mo 1682. There are several morals here: be persistent and read all the pages that might include your ancestor; don’t expect all the documents to still exist and match up neatly; remember that the spelling of names was inconsistent. Someone who owned land in early Pennsylvania got it in one of three ways: buying it from William Penn, buying it from someone else, or inheriting it. A very few people also got land as a gift from Penn; it helped to be related to him or his wife. 1 This post will discuss the process of buying land from Penn. Some people, mostly Friends, bought rights to land from Penn before he emigrated in 1683. These people are called First Purchasers. Most of them were entitled to a city lot and land in the Liberties by virtue of their purchase. They did not buy land in a specific place, but rather the right to have their acreage laid out for them. Many of them emigrated and settled on their land, but others sold their rights to others. In either case people held rights that they could bring to Pennsylvania and convert into land. This description of the boundaries is called the metes and bounds. Note that they spell out exactly where the land is, if you can find the post on the line of John Barne’s land. (It would be somewhere near the boundary of modern-day Hatfield and Montgomery townships in Montgomery County.) A perch was a unit of both acreage and length. Seven hundred perches is just over two miles. This was a very large tract. Note that the copyist in the 1800s had the usual trouble with the name of Philip Theodore Lehnmann, creating a non-existent Thlamaine. This tract was typical of one fronting the navigable rivers, with a short strip along the river, extending backwards from there. There was no date on this survey; it may have been done in 1682. He mentioned it in his will in early 1686. The survey was returned to the Surveyor General’s office, along with the return. The purchaser did not keep it; at this point he had no written proof that he owned the land. 6 The Surveyor General was supposed to check the survey to make sure it laid out the proper number of acres, and to keep it on file in his office. The final step in the process was for the landowner to apply for a patent. This was the written proof that he owned the land. It included the description of the metes and bounds, and the legal text indicating ownership. Here is a sample of the patent for Mary Southworth’s city lot. The next post will show how to find the early land records: warrants, surveys and patents. The early Quakers used certificates as a way to introduce themselves to strangers. When they left their home meeting to emigrate and join a new meeting, they needed to show proof that they were members in good standing, of good behavior, and for the unmarried, clear of marriage promises or “entanglements”. The Quakers were fastidious about not allowing young people to marry if they had any prior promises or engagements to others. Although the certificates were considered very important, the procedure for recording them was not standardized. The meeting that issued the certificate sometimes kept a record of them and sometimes did not. There might be a note in the minutes that someone had requested a certificate, and that one was written out for him or her, but there was not usually a copy kept on record. The certificate was written out for the traveller to keep. Why would you want to see them? Certificates show where someone lived before emigrating. They show the approximate date of emigration, since certificates were usually issued a month or so before departure. For a married man, the certificate might show the name of his wife and children, although not always. If you can find the full certificate, it is always worth looking at the names of the people who signed it, as they are sometimes family members. For example, the certificate of Ralph Fretwell from Barbados in 1683 was signed by Thomas Fretwell. 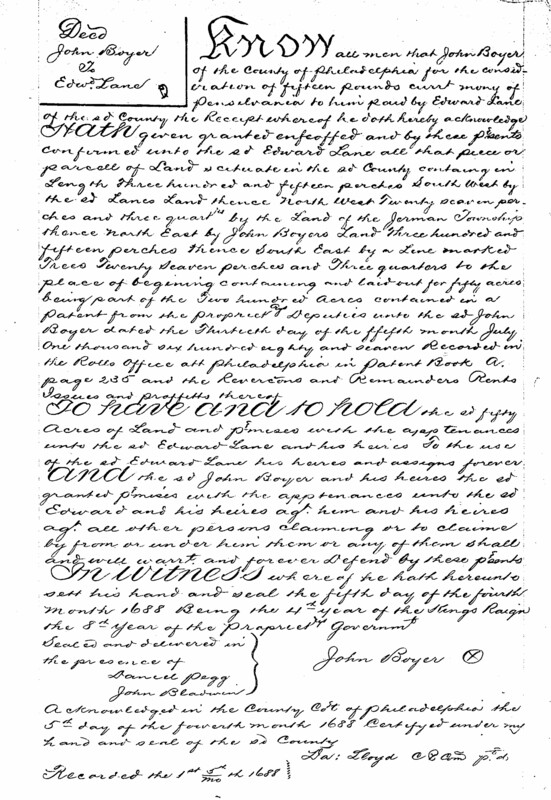 The early certificates are available in various forms (abstracts or full text) and in various places (on Ancestry’s Quaker Records collection, in published books of records, on microfilm at the Friends Historical Library, and in the church record volumes at the Historical Society of Pennsylvania. Falls "Minutes 1682-1743", a list, not abstracts or full certificates. Early Church Records of Bucks County, volume 2, edited by Watring and Wright, has short abstracts. The best source for full certificates, call numbers Bu 1F:2 and Bu 1F:4. Middletown “Minutes, marriages, certificates of removal…”. Also Philadelphia Arch Street meeting, “Record of certificates of removal 1682” Early Church Records of Bucks County, volume 2, has some listed. Not in the table of contents, they start at page 239. Chester “Register Book 1681” is a mix of early subscriptions, marriages, births, burials, certificates, and payments. The certificates are on images 13 and 14. None in Early Church Records of Delaware County, volume 1. Concord None known None in Early Church Records of Delaware County, volume 2. Included with other records, call number De 9F:2.